Inga has three children: Signija (12), Ralfs (7) and Kitija (5). Mom deals with her youngest one’s health problems and daily struggles all on her own. Dad was an alcoholic and now children are refusing to meet or even see him. This story is about Kitija who needs our help. Kitija has many different illnesses - she has epilepsy with cramps, kidney failure, hip subluxation and stomach problems. Kitija would love to go to water procedures but due to problems with kidneys its impossible. The food has to be processed too before she can eat it. Mom says, Kitija has all the problems imaginable but in spite of that mom is determined to deal with them all. Its difficult because she’s all alone so the ladies from the local social services asked for help. Kitija requires lots of hard work. Inga recalls that at first her little girl was laying like a little “pancake” but there’s been a big progress since then - now Kitija takes hold of her toys, sits on her own, claps, laughs at her brother’s jokes. Her mom takes her to therapeutic exercise and massage sessions but the amount of these procedures covered by the state is way too insufficient. Kitija enjoys spending time with other kids so she will go to a social kindergarten in Riga. Currently the family resides in Iecava but they are planning a move to Riga so that they would live closer to Kitija’s kindergarten and also it would be easier for mom to find a job. Currently Inga’s family survives on LVL 400 a month. On one hand its not a small amount but they are a family of 4 and Kitija needs special care, medicine and diapers so in the end the amount turns out to be really small. - Kitija would very much enjoy a trip to the zoo, puppet theatre or attend some other event. For now we can help by providing the afore mentioned things and she also needs LVL 500 to buy medicine and diapers and go to therapeutic exercise and massage sessions. 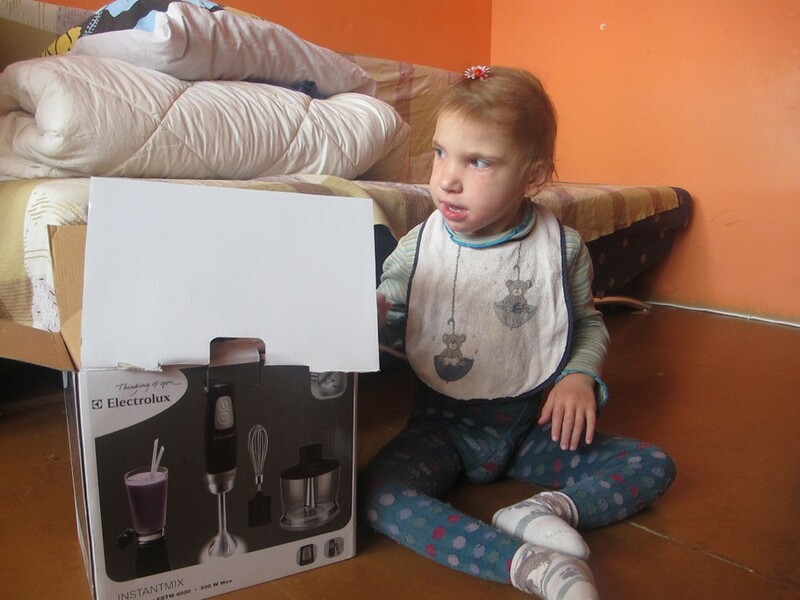 The students raised a total of LVL 50 and bought a blender that has already been handed over to Kitija. The students are very happy about having helped her!!!!! We have purchased the medicine for Kitija, 17,88 LVL were spent. The glasses for her brother are ordered and paid for-38,06 LVL. Already for the 4th year BMW Life club Latvia is making an event- “BMW Day”. It takes place in the second Saturday of September. In this festivity are invited to participate all fans of BMW car brand, apart from the club, forum, and nationality. The participants will go in a column to the cities of Latvia, in the route are included the visits of the cultural historical monu ments. The second day of the festivity will be spent in the sports complex 333 where the participants can show their car driving skills in the track, also to participate in the dexterity drives. The integral part of the event is also the gathering of donations for the children with health disorders. This time the money was collected for the girl Kitija. In total were gathered 123,16 LVL which will be used for Kitija- her health improvement, medicine, household needs. Many thanks to BM Auto for the souvenirs and titbits for the children, also to all the participants of BMW Days 2011! You can go on helping Kitija by donating the money in the account of the organization. We purchased medicaments for the total amount of 26,62 LVL. Thanks to “Ilmas aptieka” for the special prices! Every month thanks to the care of SIA Baltā Bura Kitija gets the diapers. Kitija’s brother and sister together with mum attended the play of Hockey Club Dinamo which gave a lot of unforgettable moments. After the play children had possibility to take pictures with hockey players and children got special presents! Special thanks to the hockey player Jamie Lundmark. We purchased medicaments for Kitija’s family for the total amount of 29,03 LVL. Thanks to “Ilmas aptieka” for the special prices! During the charity event organized by Youth Council Of Iecava 786,74 LVL were gathered for Kitija. Kitija has got a special chair, toy, medicaments for the total amount of 121,05 LVL. Kitija’s family had an unforgettable day at Līvu Aquapark in the end of the year where they also got Christmas presents. Kitija, her brother and sister, as most of children, were ill several times this winter. We purchased medicaments for the total amount of 29,94 LVL. Many thanks to “Ilmas aptieka” for the special prices! We paid 81 LVL and 97,89 LVL about different equipment for training and massage, toys and developing games; medicaments for the total amount of 206,63 LVL. Many thanks to our friends- “Ilmas aptieka” for the friendly prices! Medicaments for the total amount of 113,11 LVL were paid. Medicaments for the total amount of 47,01 LVL were paid. Sister Signija has taken part in the Youth club activities of Palīdzēsim.lv and brother Ralfs will participate in the camp “Spēkarukši”. Many thanks to Spēkaruksis about this possibility! Medicaments for the total amount of 38,67 LVL were paid, also glasses for Kitijai for the amount 129,80 LVL. Signija took part in the Summer academy in Koknese! 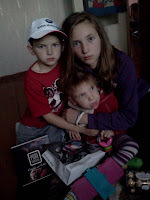 In the beginning of the year Kitija and her brother and sister were ill a lot, it took quite big efforts to get well. Medicaments for the total amount of 180,25 Ls were paid. 650 EUR - we are glad about the huge activity of the Dinamo Rīga hockey club fans during the 6th season. During the auction 650 EUR were gathered which will be used for monthly medicaments and vitamines for Kitija. Many thanks!